You might want to cozy up next to a fireplace on New Year's Eve. 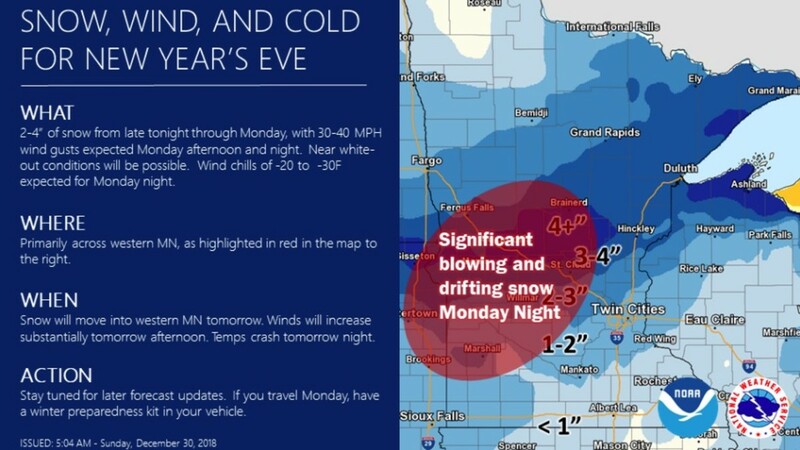 It looks likely that the Twin Cities will get a fresh coating of snow up to two inches on New Year Eve, but the most significant snow impacts will be felt in western, central and northern Minnesota. Brainerd and Alexandria, which were walloped with a foot of snow just a few days ago, could get another 4-5 inches of fresh snow. Just to the south, a good 3-4 inches is possible in places like Willmar and St. Cloud. The real issue, however, will be winds gusting close to 30-40 mph, causing significant blowing snow issues, which will create whiteout conditions and drifting snow in the area circled in the map below. Meanwhile, a winter storm watch is in place for southern St. Louis County and Carlton County in northeast Minnesota. Up to half a foot of snow could fall in Duluth through New Year&apos;s Day morning. A separate storm system will bring heavy snow to southern Wisconsin, so the Twin Cities is pretty much tucked between a couple of storms and won&apos;t get hit hard by either. It&apos;s a shame for snow lovers, but that&apos;s the way it goes. In addition to the snow and blowing snow, frigid temps will arrive New Year&apos;s Eve. 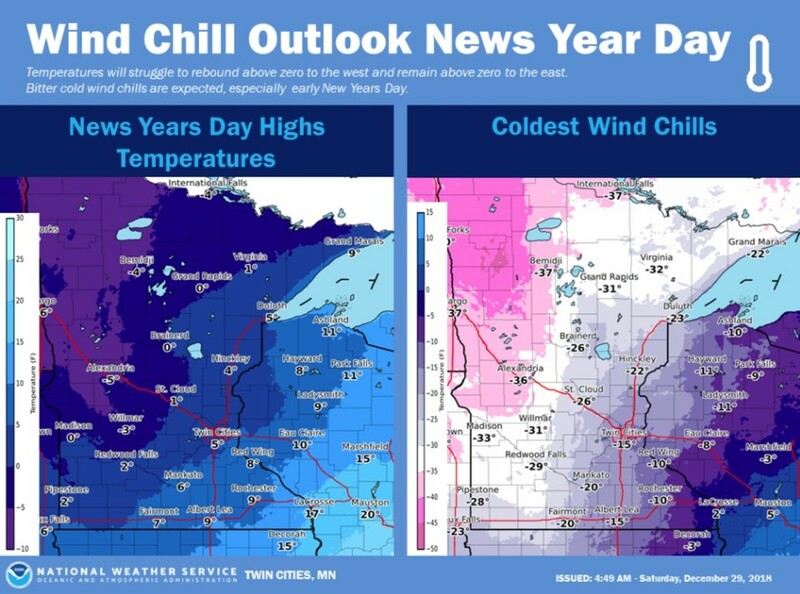 Temps will struggle to crack zero on New Year&apos;s Day and wind chill readings will be -15 or so in the Twin Cities and -20 to -40 in parts of greater Minnesota. Snow lovers, it might actually snow in the metro on Sunday and Monday. Wind chill values will be insane Tuesday-Friday. There will be two areas of heavier snow totals. Areas hit hard over the weekend might be spared by Tuesday's snow. It'll be cold enough that any precipitation will likely fall as snow. The highest totals look to be in places like Walker, Grand Rapids and Duluth. Thursday's commute to work and school could be slick.